This article explores the theory and practice of awareness-based and will-based counselling, as derived from the core concepts of Assagioli’s psychosynthesis. The aim of this type of counselling is the discovery of the self as a loving observer and powerful actor. The following article is based on chapters 4-6 of my book The Soul of Psychosynthesis (2016). When I first started working with Maja, it was clear that she lived life in her head, and I noticed myself quickly becoming frustrated by her rationalisations and her lack of contact with her emotional life. She was superficial because her world was built on reason and lacked emotional depth and bodily experience – and this was why she had come to me for counselling. In particular, she was unhappy about her love life. She was 33 years old and wanted to start a family. She had not had a serious relationship for five years and seeing her friends find partners and have children had left her feeling increasingly desperate to settle down. She was in a sexual relationship with a married man, but it was obvious he was never going to leave his wife, so the relationship caused her more pain than happiness. I knew our journey would involve a “descent” into her body and emotions, and that establishing a sense of presence and intimacy would be our first goal. When she told me she was unhappy, there was no emotional charge in the room, and when she told me about her love for the man in her life, I was unable to sense her feelings. In other words, my experience told me she lacked an energetic felt sense of her feelings and body. I explained she could learn to identify with her observer-self and begin to sense her body and the emotional content behind her words “I am unhappy”, “I love him”, and so on. I wanted her to experience an emotional depth so she could become aware of and learn to incorporate more of her inner world in her everyday life. In brief, my aim was to train Maja to experience herself as a centre of pure self-awareness and will, meaning a loving and present witness to her psychological processes. Figure 1. Assagioli’s Egg-diagram, the white point in the middle is the observer and the conscious “I”. The borders between the levels are transparent, so there is an exchange of energies between them. What does it mean to be “a centre of pure self-awareness and will”? We know it is one of the core definitions of the self that Roberto Assagioli used, whether speaking of the personal or the transpersonal Self. But how does one work practically with this self-experience and why is it important? These are fundamental questions to answer if we are to understand what constitutes the soul of psychosynthesis. With his famous statement about the seven core concepts of psychosynthesis, Assagioli (1974b) is describing the essence of psychosynthesis, and he places disidentification and the personal self at the top of the list. 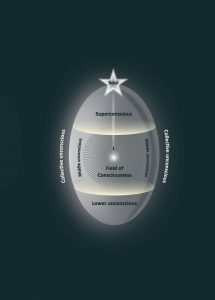 This illustrates what makes psychosynthesis unique when compared with other counselling approaches – it is precisely the fact that psychosynthesis defines our central identity as pure consciousness and will, which is distinct from our thoughts, emotions and sensations. In this respect, Assagioli was deeply inspired by Eastern philosophy, especially the perception of the transpersonal Self in yoga philosophy. Pure-consciousness, awareness and presence are all terms pointing to the fundamental fact that we are consciousness itself – that we can observe the content of consciousness, or the stream of consciousness, from the neutral position of the observer. We might not understand the exact nature of consciousness, but it is nevertheless a phenomenological fact with deep implications and practical benefits despite its mystery. The observer is not a place but a space – who we are in the most fundamental sense. When we sit in meditation and seek to observe the observer – i.e. to turn consciousness towards its source – we find nothing else but consciousness (and will – but more about this later). In one of his letters Freud said, “I am interested only in the basement of the human being.” Psychosynthesis is interested in the whole building. We try to build an elevator which will allow a person access to every level of his personality. After all, a building with only a basement is very limited. We want to open up the terrace where you can sun-bathe or look at the stars. Our concern is the synthesis of all areas of the personality. That means psychosynthesis is holistic, global and inclusive. Assagioli (1974: chapter 9) compared his egg-diagram with Maslow’s Hierarchy of Needs, and this suggests what type of needs we encounter at the different levels, as been illustrated in Figure 2. Figure 2. 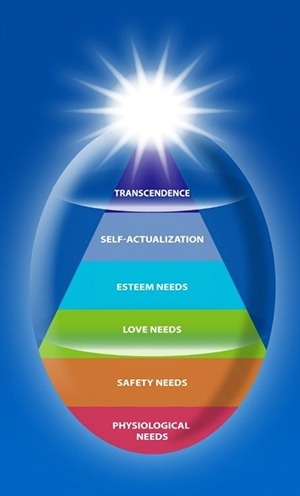 Assagioli’s egg-diagram compared with Maslow’s Hierarchy of Needs. It was obvious that Maja spent most of her time in her inner house on the floor dominated by rationality and logic. She was not aware of the riches of the self that were “above” or “below” this level. It was necessary for Maja to turn the light of consciousness onto her inner reality so that illumination could happen. In doing so, she could see how much she contained and how this affected her behaviour in so many ways. In practice, doing this is much harder than it sounds because it feels uncomfortable to enter the dark rooms where old and painful conditions reside. However, doing this is imperative if we want to find freedom. Awareness-based counselling is fundamentally about training the client to be present and aware of what is happening in the body, the emotions and the thoughts whatever particular therapeutic theme is being explored. After introducing the concepts of the inner house and the observer as a light that can illuminate the activities in this house (i.e. sensations, feelings, thoughts), I ask the client to turn their attention within. The client can sit with closed or open eyes, depending on their type, and slowly I guide the client into a calm observation of the breath and of whatever bodily sensations, feelings and thoughts are present in relation to the theme we are working with. What follows is a reflective meditation on the content of the client’s consciousness, which serves as a training for the client in finding the right words for the sensed and observed energies. The effect for the client is a sense of “coming home”, of starting to access all levels of the inner house so that a new and better atmosphere can be created. To bring awareness into the unconscious areas is the start of the process of building an illuminated house – it is enlightening and transformative when the unconscious is made conscious. When Maja spoke about her unhappiness, we took time to sense where she felt this unhappiness in her body. Was the sensation warm, cold, heavy, sharp, captivating? As we investigated the nuances of her unhappiness, this led to the discovery that Maja was also angry: angry at herself and at the man in her life because she felt exploited and because she realised she had let herself be exploited. At the start of our work together, Maja was what I would call emotionally and bodily illiterate, with her experience of her self reduced to a small rational part of her inner reality. Because of this, she had few words to describe what was unfolding within. But gradually, as the sessions progressed, she started to establish a greater intimacy with herself and her inner world, and found a new language with which to describe it. Coming home to oneself means to be with what is, without fixing it or running away from it. Next, the task is to master whatever is there – because it’s not enough to simply witness our experience. Typically, coming home to ourselves involves the pain of becoming consciously aware that we are a slave to reactional patterns which are not very attractive. But we can do something about it – we can become the “master of the house”. This is exactly what psychosynthesis is all about. Mastery requires love and will besides consciousness – which I will explain. Empathy is the key because observing something with loving-kindness will harmonise the split-off parts and heal brokenness. Love is magnetic, creating integration and synthesis, a unification between the lover and that which is loved. This creates intimacy. So it is not enough to be an objective observer, we must also become a loving observer. In the beginning, it is often the counsellor that must hold a sense of acceptance on behalf of the client who is too identified with the repulsive parts and rejecting of their unwanted energies and subpersonalities. However, through a loving presence and by adopting the perspective, or identity, of the loving observer, the client will slowly dissolve the inner tensions between the rejecter (a subpersonality) and the rejected (a subpersonality). With Maja, the task was to let her discover her emotions and begin to own them, which means accepting they belonged to her and were important to relate to. In the beginning, I had to act as the external unifying centre of empathy. However, awareness-based counselling puts the responsibility on the client as quickly as possible, which is done by strengthening the client’s identification with the loving observer that is able to hold the vulnerable aspects. In other words, awareness-based counselling enables the client to become open, attentive and accepting by helping them to realise the fundamental fact that they are, in essence, a loving observer. As a result, the client comes to realise they are a centre of pure consciousness and will – and here we touch one of the most crucial elements of psychosynthesis. Psychosynthesis differs from Gestalt therapy and other schools of counselling that work with awareness in that we emphasise that there is a subjective centre, an inner identity and entity that lies behind our thoughts, emotions and sensations. We call it the self. This self is a living being whose basic features are consciousness and will. The self can be conscious of whatever is happening within and can then choose how to relate to what is happening. (More about the will later.) Psychosynthesis also differs from Buddhism and mindfulness-based techniques in that we see the self as a living subject. In Buddhism, there is no centre, no self, and this makes it more difficult to work with integration. Psychosynthesis is about integrating, harmonising and synthesising all elements in the three unconscious areas around a centre. The centre is the context for unifying the fragmented parts that are often in conflict with themselves. The centre is the observer. This observer is not an idea or a perspective, it is not an emotion or a place in the body – anything we can observe is not the loving observer because we are the one who observes, we are the ones who love. This is a fundamental fact that everyone can awaken to. At the beginning of the process, the observer is more like a theory or a perspective one chooses. Most clients can quickly understand and experience that they can observe sensations, feelings and thoughts using an awareness-based approach, but this initial insight often arises from the analytical mind, which can separate and analyse the various contents of awareness. In other words, even though the client may be able to disidentify from the contents of awareness and identify with the observer, they are still identified with the analytical mind. It is not this inner person, or commentator, that becomes awakened when we realise we are in essence contentless-awareness – rather, awakening involves the discovery that our fundamental identity is and always has been consciousness and wakefulness, unfettered by the processes of thought, emotion and sensation. This is a revolution for the client when it happens. With it, a stable still presence is found – which is always the same. The client has found the eye of the storm, and finds it almost shocking that the discovery itself is so simple and natural. The impact, first of all, is a sense of freedom and an ability to disidentify in relation to all the strong and alluring forces unfolding within. The awakening of the loving observer usually happens gradually. For example, if a person has a strong identification with the mental field, their observer will experience life largely in rational and objective terms. But as the loving observer becomes more aware of other aspects of life – such as feeling and bodily sensation – the observer grow in these areas, becoming more capable of intimacy (feeling) and physical presence (bodily sensation), as well as objectivity. In fact, consciousness works through all of the fundamental functions – thought, feeling and body – and a person might identify most strongly with any one of them. However, a distinction must be made between consciousness – which is the loving observer, the detached stillness at the centre of the self – and the contents of consciousness – which includes all thoughts, feelings and sensations. Furthermore, the development of the psychological functions and the development of the loving observer happen independently. I am not implying that the discovery of the loving observer is related with a particular psychological state, because the loving observer can be present within anger, depression, joy, ecstasy, all of which are the content of consciousness and not consciousness itself. The observer is more the detached and loving stillness in the centre of any state. Gradually, Maja developed an ability to be present in the here and now with whatever she was experiencing in the moment. She was able to step outside of the stream of consciousness simply by breathing and observing what was happening, and from this point she was able to observe what was happening in the most beneficial way. She also developed a more nuanced language for describing the states of her awareness. Before the observer becomes a reality for the client, we must apply the technique of disidentification. The awareness-based counsellor has to continually show the client that he or she is fundamentally the loving observer. However, this is a difficult task because the client will have become so strongly identified with learned and limiting convictions that are not easily dissolved. Disidentification involves adopting the position of the observer in order to see one’s conditions from a distance. We are typically so deeply identified with our conditions that we are unable to see them. These conditions include feelings, beliefs or objects in our environment, such as people or possessions. When we disidentify with something, we make “subjects into objects”, to use the phrase of the American thinker Ken Wilber. This is a brilliant description! Suddenly, something I used to consider to be ”me” becomes something external. This does not mean a complete separation between ourselves as observers and the observed. Rather, the aim of disidentification is to be able to encounter and accept any part of our self with love, from the perspective of the loving witness. Creating such a duality between the lover and the beloved is a precondition for a loving relationship. It is a radical step of awakening to affirm that our essential identity is consciousness, and in holding this view Assagioli is in agreement with all the great mystic, yogic, tantric, and Buddhist approaches – all of which affirm that our nature is fundamentally consciousness. In this respect, psychosynthesis is a synthesis of Eastern wisdom and Western scientific insight. This is the position we are encouraging our clients to take – and I have few clients who are not able to do this – and our goal is for the client to adopt this position as soon as possible in counselling, just as Assagioli recommended. Adopting this position will not create internal splitting because it is the nature of the loving observer to be in relationship with that which is observed; hence, there will be a loving relationship between the observer and the observed, i.e. with all the contents of consciousness: thoughts, feelings and bodily sensations. As a precondition for this piece of work, it is essential that the counsellor is able to demonstrate this position by working as an observer and holding that space. From the perspective of the observer, the counsellor must discern and identify the areas with which the client is identified – this is done by paying close attention to every communication of the client – every expression that suggests an identification with a thought, emotion or bodily sensation – for example “I am angry, frustrated, ugly, stupid, etc..” Whenever the counsellor, working as an observer, is able to point out such identifications, then a process of disidentification can follow. There are many ways to conduct the disidentification process. Invite the client to sit with eyes closed and to experience their inner space, simply being present with whatever is there, whether it is a particular condition or subpersonalities. In this way, a distance is created between the loving observer – awake in the head, loving from the heart – and the chosen condition or subpersonality that is present. The client could then be invited to draw or paint the condition, or to hold it symbolically in their hands or to place it on a chair in the room. In this way, the condition is externalised and objectified: now it is possible to love the condition from a distance – whether observing the condition with the imagination or on the painted page. The key is for the counsellor to understand that the client is an observer who is able to disidentify from any form of self-identity. One therapeutic reason not to pursue this process is if we want to temporarily encourage the client to fully identify with a particular condition or part – for example, the hurt child, the victim, etc. – as part of a piece of work to process and accept the feelings of that condition. But once that work is done, then the client can be encouraged to disidentify with the condition through identification with the loving observer. Another exception to following the disidentification process is when a client is simply not ready or able to disidentify because the pain is too strong or the gain is too much to handle, as is often the case when working with a strong identification with a victim part or other strong conditions. In these cases, the counsellor can hold the possibility in the field and gradually train the client to observe, love, breathe through and let go. In practical terms, three perspectives are worked with in an awareness-based approach: the first, second and third person perspectives. In the first person perspective, the client, who at this point is fully identified with the condition or subpersonality, is encouraged to express whatever emerges in this condition. At a point, the client is invited to become self-aware as the loving observer – this will lead to a space of observation in which the conditions that are present can be contemplated without full identification. In the second person perspective, the client is invited to dialogue with the condition, asking questions and listening to the replies – here, the aim is to attain cooperation and a loving exchange between the observer and the subpersonality or condition. In the third person perspective, the client is invited to see the condition from a distance, describing it and talking about it. Often there is a flow and a flexible exchange between the different perspectives. When mastered by the counsellor, this technique is an incredible tool for insight and integration. There is only one Self. Assagioli was clear in stating that essentially there are not multiple selves but only one Self that unfolds at different levels. This means that consciousness, the inner light and the observer are identical. The personal self is in fact a reflection of the transpersonal Self, which is the luminous source of consciousness; the difference between the personal and transpersonal is only a matter of the amount of light that is present. The “size” of the Self depends on how much one can include and hold in conscious awareness – from the lower unconscious to the superconscious and beyond. An enlightened person will, without doubt, based on inner experience, know that the consciousness looking through the other’s eyes is the same as the consciousness looking through my eyes. The essential difference between the personal self and the transpersonal Self is a difference in the degree of freedom from attachment to the content of consciousness. Whenever we are experiencing the consciousness of the personal self, there is an experience of separation – there is a clear perception that “I” am something different than “you” – which comes from the fact that the observer is operating through the mental field, as a mental eye, which limits and creates duality. But there is also a movement towards the superconscious – this happens naturally when observation of consciousness is practised over time, in silence, leading to an experience of a spontaneous expansion of consciousness that transcends beyond the limitations of the body and psychic contents into the infinite. When this happens, there is a complete cessation of thought and a sense of freedom from the prison of the mind. This brings with it a state of peace and an ability to be present in the here and now. From this place, thinking seems like a straitjacket – It is possible to think, but thinking is seen as limiting the unlimited in a tiny form. In the place of superconsciousness, there is a new experience of identity, or “I-Am-ness”, which is a wideness like being the still immovable background of everything which arises in consciousness. We are never something other than me, but when we transcend the personal self there is a much freer and more expanded version of me, the transpersonal Self, which is not restrained to the personal story of the smaller I. Figure 3. Assagioli’s Star Diagram with the psychological functions: 1. Sensation (body), 2. Feeling-emotion, 3. Desire-impulse, 4. Imagination, 5. Thought, 6. Intuition and 7. Will. The white light in the centre is the consciousness and the Self. Awareness-based counselling is occupied with developing a fully integrated human who is able to express all the psychological qualities through the body, feelings, thought, intuition, and so on. Ideally – in line with the concept of identification/disidentification – the functions are developed but the identity is withdrawn from the functions, as with the experience of having a body but not being a body. In his Star Diagram (Figure 3), Assagioli describes the functions as 1. Sensing (body), 2. Feeling, 3. Desire, 4. Imagination, 5. Thought, 6. Intuition, and 7. Will. The white light at the centre of the star is consciousness and the self. An awareness-based counsellor will always, when the client is ready, point to the fact that identity is based in consciousness. There are no other identifications that provide the same degree of freedom and permanence. If you have awakened to consciousness itself, you can choose to identify temporarily with anything without becoming attached. Consciousness is free, detached and able to flow through all the psychological functions to have valuable experiences. Nothing else in us has this quality. To give an example, the body must function well in order to make physical activity possible, so we might temporarily identify with the body to achieve this. Indeed, this is important because body-consciousness helps to integrate the body with the other functions – feeling, imagination, thought, desire, will and intuition – which can all be liberated through the body. This development of body-consciousness involves a process of identification and disidentification with the body as we can examine and experience the reactions of the body from all three perspectives. This process also requires that we activate the body in counselling through touch, role play and other active techniques. In this way, we can observe the body in action and see where it is free and where it is inhibited. I worked with a man who was unable to sense his emotions. No matter which exercises I did with him – presence, drawing, role play – he had no access to his feelings. I had an impulse to reach out and touch his thigh: now he was able to sense feelings of discomfort, which was a breakthrough in the counselling. We needed to go through the body to gain access to his emotions. When our real identity is consciousness itself, what is the purpose of all the other identities we create through the roles we play in life and what is the purpose of the psychological functions we are identified with? We identify with many roles, for example the roles of parent, lover, our profession, whether we consider ourselves to be clever, sensitive, beautiful, ugly, strong, and so on. Ken Wilber says we have different “stage-selves” which means we identify with different sides of our selves at different stages of our evolutionary and psychological journey. Figure 4. The Eight Stages of Psychosynthesis (see Sørensen 2017 for a full discussion). At first, as a child, we identify with the body, which will function as our seat of conscious identification. The entire outer world, and physical objects, are included in this identity. The body, how it looks, and these external objects become the defining focus of who we are. We could call it the body “self”. Later, the emotional life develops and becomes the seat of identity, and we fully identify with both the positive and negative feelings and experiences that happen to us, in particular our experiences in our family and relationships. We could call it the emotional “self”. Next, we become occupied with defining our identity through the mind – and our thoughts become the seat of conscious identification. In particular, we identify with aspects of our lifestyle, such as our education, job, interests, ideas, culture and the people we associate with. This could be called the mental ”self”. At a later stage of development, our consciousness awakens to the fact that we are part of both a greater global reality in the outer world and a greater connectedness inwardly. When this happens, we are stepping into the transpersonal realm – here the Soul ”self” starts to form. At this point, consciousness is focused on finding meaning, on finding a place in a larger global context, and on discovering how to serve and contribute to help make a better world. There are many ways of experiencing the Soul “self” depending on the psychological function we most identify with (each function acts like a filter through which we experience reality). This is what Assagioli called the seven ways to the Soul because each psychological function provides a way to the Soul. However, the most important phase in this stage of awakening is the realisation that our consciousness is independent from the psychological functions; we discover that our consciousness is the Soul, and our experience of our Soul is only limited according to the functions we have identified with. Few of us are fully enlightened, so we will always (relatively speaking) be identified with at least some of our psychological functions. However, our endeavours to become identified with the loving observer will minimise our attachment to these functions because, essentially, the loving observer is the Soul. This awakening of the Soul is the purpose of awareness-based counselling. Awakening to consciousness involves the healing, harmonisation and development of all the psychological functions at the various stages of development of the “selves”. In other words, all the stages of self-development – i.e. the development of the functions through the different “selves” – are necessary on the path to full self-realisation, because the soul wishes to manifest its power, love and wisdom through the body. Unlike many of the various Eastern and Western mystical and religious pathways, psychosynthesis has a life-affirming approach that is focused on the unfoldment of all our inherent resources. The classical religions often have a focus on diminishing the physical life through asceticism so that the Soul can transcend into heaven or nirvana. By contrast, psychosynthesis and many contemporary spiritual approaches are more focused on manifesting spirituality. 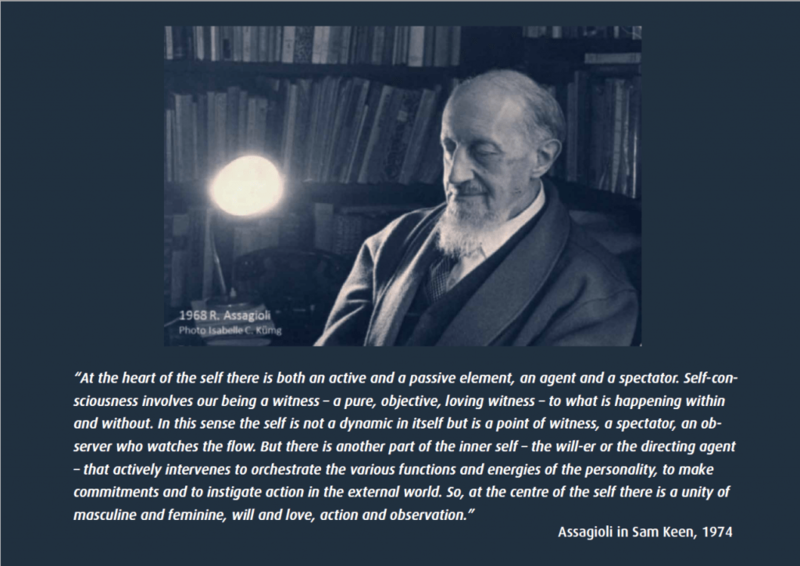 From this perspective, the purpose of the body “self”, the emotional “self” and the mental “self” is to act as temporary focal points of identity until the time comes where we are ready to identify with consciousness itself – which, in transpersonal terms, means a leap into the timeless, omnipresent Now that perceive life as the love-filled presence of conscious awareness. This Now, in its deepest essence, is not the Soul but the Universal Self, the conscious living presence that sustains all life; this living being is ultimately you, me and everything that is. There is something in us that, while we are in this world, that drives us on, making use of the psychological functions, in our striving to manifest all the light, love and power; this something is the will. The will is a central factor in awareness-based counselling because after we disidentify, we must choose what to identify with – and this is an act of will. Assagioli even indicates that we are a will. Indeed, if anything is unique in the approach of psychosynthesis, it must be the emphasis that is put on the will. So, having until this point focused on an awareness-based counselling style to help facilitate disidentification from the contents of consciousness and identification with consciousness itself, there is now a shift in focus to a will-based counselling style. But what is will? The will is a living force that prompts and propels us to grow and become our true and authentic self. The will is an aspect of the self – not just consciousness, but a dynamic power in each of us that is continually seeking to manifest and evolve. In this respect, we can say that the will is ultimately the evolutionary impulse in each human being – the will prompts us to evolve from the personal to the transpersonal to the universal. Indeed, the will was the initiating factor in the Big Bang and is still at work and present in you and me. At the heart of the self there is both an active and a passive element, an agent and a spectator. Self-consciousness involves our being a witness – a pure, objective, loving witness – to what is happening within and without. In this sense the self is not a dynamic in itself but is a point of witness, a spectator, an observer who watches the flow. But there is another part of the inner self – the will-er or the directing agent – that actively intervenes to orchestrate the various functions and energies of the personality, to make commitments and to instigate action in the external world. So, at the centre of the self there is a unity of masculine and feminine, will and love, action and observation. Of course, we are not just governed by the conscious intention of our will – we also fall under the influence of unconscious drives and factors in the environment. It is therefore necessary to develop and awaken to the will if we are to live authentic lives rather than fall under the influence of others. We can say that while consciousness connects us to who we are (self-realisation), the will connects us to why we are by directing us towards fulfilling our life purpose. The consciousness of the self is the captain of the ship and the will is the ship’s mate. Consciousness is a precondition of the will. To make conscious decisions, we must be aware of our resources, potentials and needs. However, not all of our choices are made consciously – many of our actions do not stem from the will but from one of the other psychological functions, for example our unconscious choices might be prompted by fear or desire. Assagioli describes three aspects of the will: good will, strong will and skilful will. 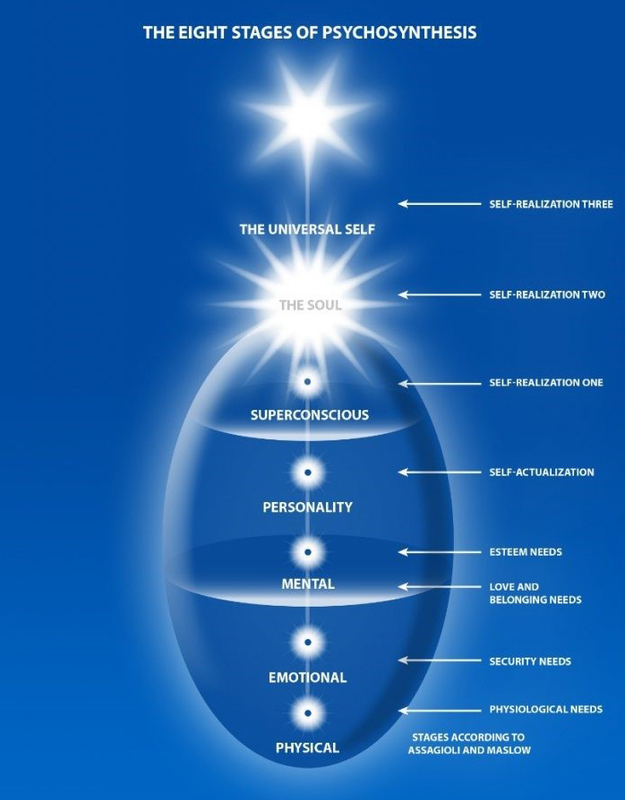 He describes the will as having three levels: personal, transpersonal and universal. He also describes many qualities of the will and methods to train it. Accordingly, in awareness-based and will-based counselling, there will always be an emphasis on teaching the client to listen to the will and how it connects with the experience of self-identity and how this self is expressed. Seen from the perspective of will, identity is not something we are, but something we must continually choose as part of a conscious awakening process. The will is the ability to consciously identify and disidentify – i.e. the ability to say “This is who I am!” or “This is not me!” This ability to choose is the key: when we identify with something, we give it life and attention (will and consciousness) and it becomes strong and vital; on the other hand, that from which we withdraw attention and awareness will eventually die. Hence, we can choose what roles we want to play in life and how to express them. When we turn consciousness towards its own source, for example during meditation, we can notice that we are always holding an intention, or purpose, even though we might not be aware of making an effort to do so. No matter our state of mind or mood, there is always a choice being made, with our intention kept alive in consciousness. This intention is the will. 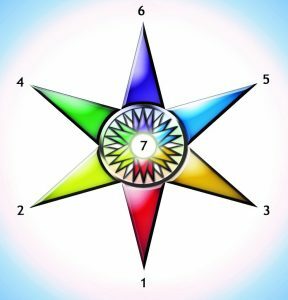 We can also notice that we are always faced with a number of options – with different desires – and there will always be one choice that is more authentic than the others, a choice in which a dynamic energy is indicating the direction in which we should go. This dynamic energy is the will, and the transpersonal aspect of the will is the Soul’s calling. So the will is always the will of a living subject and entity within, be it personal, transpersonal or universal. In summary, to reiterate the words of Assagioli, we are each of us “a centre of pure consciousness and will”. Our task is to translate all of these ideas and concepts into awareness/will-based counselling! Therefore, one of the first things I ask a client is: Where does the journey go? What kind of growth do you want from these sessions? I use metaphors – such as becoming the captain of our lives or the master in our own house – and encourage the client to set their own agenda for counselling and to manage it. I explain the fundamental fact that there is a power in our lives which is the will to be our true self – which is a vital driving force that we must discover if we are to find fulfilment. This will is a demand for authenticity and genuineness and a command to discover our uniqueness. Whenever the client discovers the goal, a focal point of the will emerges. This goal might not initially appear to be connected to the will – for example, it could be a desire to be more spontaneous or peaceful – but, when we look more closely, we see that the will is present in the form of the purpose and intention behind the goal. Because the will uses all the other psychological functions, to carry out its purposes. Maja was occupied with getting her love life back on track; she had a will for love to succeed. Our first sessions were centred on Maja consciously taking responsibility for her life by deciding what she wanted from counselling. My intention with clients is always not to make decisions on their behalf, but rather to provide a space in which the client can feel empowered by act of taking responsibility for their lives. Maja told me she wanted to end her affair because it did not meet her needs or fit her values; she remained in it because of her attachment to the superficial appreciation she received and because she hoped he’d leave his wife. It can be seen that there was a conflict between Maja’s will and her desire – something that most people can relate to. Maja’s will – the authentic will-to-freedom – informed her that she deserved better, while her desire and attachment kept her in the relationship. But the will kept urging her to seek something different – the will is an evolutionary power that continually pushes us outside of our comfort zones in search of greater love and authenticity. Indeed, the will carries the power of the archetypal King and Queen, which is the nature of the Soul and the transpersonal self. When confronted with tough choices I often asked Maja “what say the Queen”? The Queen being her Soul. This question made her align with her sovereignty and dignity which is a profound and effective way to identify with the will. When the evolutionary flame of the will is awakened and realised, a clear direction emerges in a person’s life, whether at the personal or transpersonal level. For Maja, this realisation involved letting go of the low self-esteem that had kept her in a relationship in which she was not being chosen, seen or respected. During counselling, Maja came to understand how she had not been able to acknowledge her true value. The will brings freedom, in contrast to dependency and the role of victim. 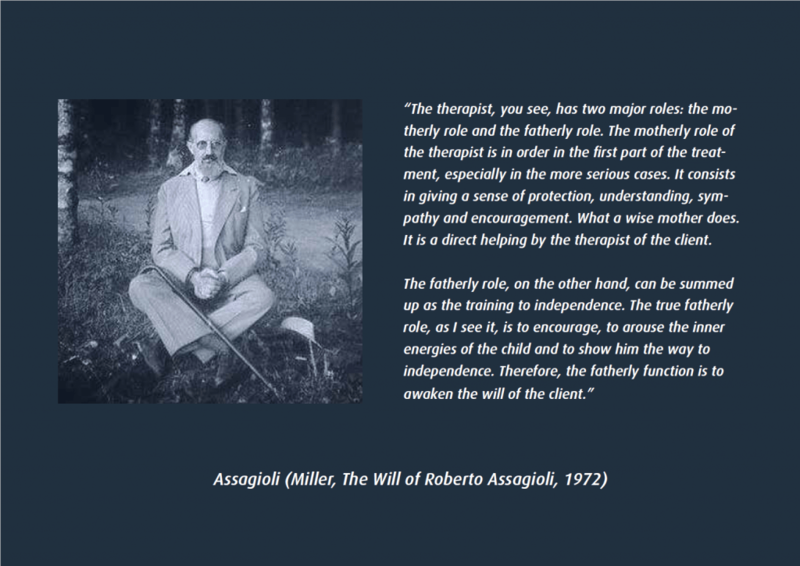 Hence, if we do not focus on the will during the therapeutic process, the client can regress, especially if the therapist focuses too much on offering care, which can keep the client in a state of dependency. One way to acknowledge the will-nature of the client, is to call the client’s chair the director’s chair, the captain’s chair or the decision-making chair. The aim is to encourage the client to consciously identify with being the conscious loving witness that is able to make decisions. Another useful technique is to use other chairs, in which the client is encouraged to place different subpersonalities – thereby objectifying them – then the client, from the director’s chair, can practice managing their different subpersonalities, with their different goals and agendas, and in this way the client can learn to take charge of her inner world. An essential mirroring happens in the relationship between the client and counsellor. When the counsellor is authentic, caring and authoritative, both professionally and personally, this power will be transmitted to the client. As the client experiences the therapist’s efforts to encourage the client to become whatever they choose to be, this strength and power will activate the client’s own strength and power. This transmission, or transfer, of strength is a central focus of will-based counselling – it helps clients to see themselves as the therapist does, which gives them the freedom to identify with and choose their true self, according to the given evolutionary stage. The therapist, you see, has two major roles: the motherly role and the fatherly role. The motherly role of the therapist is in order in the first part of the treatment, especially in the more serious cases. It consists in giving a sense of protection, understanding, sympathy and encouragement. What a wise mother does. It is a direct helping by the therapist of the client. The fatherly role, on the other hand, can be summed up as the training to independence. The true fatherly role, as I see it, is to encourage, to arouse the inner energies of the child and to show him the way to independence. Therefore, the fatherly function is to awaken the will of the client. We can see that what Assagioli refers to as the motherly role could equate to love, which is emphasised in awareness-based counselling, while the fatherly role equates to will, which is explored in will-based counselling. In pursuing this work, we have taken a great step once – through the practice of disidentification and identification – we have had a direct experience of the loving observer and of the will as a living power. In the process, we come to see that psychosynthesis is peace work in that it brings together conflicting aspects of our selves into a harmonious expression of love and will. A precondition for attaining such peace is the discovery of the loving and dynamic centre of the self, which is our inner peacemaker. Assagioli, R. (1965). Psychosynthesis. Hobbs, Dorman & Company: New York. Assagioli, R. (1974). The Act of Will. Penguin Books. Sørensen, K. (2016). The Soul of Psychosynthesis. Kentaur Publishing.